An account of the walk out in the central post office during the general strike in Luxembourg, 1942, by the son of one of the participants using his father's papers. George Kieffer was born in 1950, the son of Michel Kieffer, a technician of the Telephone Department of the Luxembourg Post Office, who was active with his wife in the Resistance during the Second World War. Following the death of his father, George, who now lives in England, transferred the former's collection of papers, documents and medals to the Second World War Experience Centre. From some of these papers he has drawn the story of the short-lived General Strike at the Luxembourg Post Office on 1 September 1942. Amid the turmoil and confusion of the night of 9 - 10 May 1940, when the German forces sprang across the borders of Belgium, Holland and Luxembourg, there was little time to spare a thought for the Grand-Duchy, which for the second time that century saw itself invaded by German armies. Luxembourg, a country the size of Dorset, did not have a standing army and observed a policy of strict unarmed neutrality. The token resistance made by a handful of policemen and customs officers manning the border crossings and the anti-tank obstacles on the main roads from the German border was swiftly swatted down by the might of the German Wehrmacht. The Government of the Reich for its part assures the Grand-Ducal Luxembourg Government that Germany has no intention to jeopardise the territorial integrity and the political independence of the Grand-Duchy through its actions, either now or in the future. Grand-Duchess Charlotte and her family were determined not to stay in a country under Nazi control. My father had been part of the telecommunications team which installed the hot-line, direct from the Luxembourg-German border to the Grand-Ducal Palace, less than 15 miles away, which gave the Royal Family prior warning. At 8 a.m. on 10 May the Grand Duchess and her Government crossed the French border at Rodange, the South Western most corner of the country, as German tanks approached and as the rest of the country was already occupied. She starred a journey that was to take her through France to Britain and eventually Canada. The Germans for their part who rushed to the Grand-Ducal Palace found it empty and considered this the first hostile act of this small country. Luxembourg was always considered part of the Greater German Reich. Luxembourgers speak a Germanic dialect not very different from that of the Hunsrück to the East of the Moselle and learn German from the first year of primary school. It was therefore not surprising that the Germans should regard Luxembourgers as their natural kinsmen and the German occupation troops were surprised to be met with stony-faced hostility. As the military departed to be replaced by a civil administration, the German officers warned that behind them would come a band of criminals. That band was led by the Gauleiter Gustav Simon, a failed teacher. The Grand-Duchy was annexed to the Gau Moselland, comprising the ancient Roman city of Trier, and Koblenz. Led by the Volksdeutsche Bewegung (Movement of German peoples), the whole panoply of Nazi party and allied organisations was quickly implanted, aimed to incorporate Luxembourg into the German Reich. At all levels of the administration the responsible positions went to German nationals and very rapidly the Nazi Party machinery assumed a far-reaching control through all aspects of social and family life. A plebiscite was announced for the 10 October 1941, in which, among the usual questions about marital status, the Gauleiter had inserted additional questions about nationality and mother-tongue. It was clearly indicated that the answer 'Letzeburgesch' to either of the last two questions was prohibited, as Luxembourg was neither a language nor a nationality. Imagine the surprise and anger of the Gauleiter when he discovered the day before the result was due to be announced that no less than 97% had responded 'Letzeburgesch' to both questions. It was against this background that the next step towards integration was to be taken. On Sunday, 30 August 1942, in the Exhibition Hall of Luxembourg, Gauleiter Simon proclaimed the decree calling up young Luxembourgers born between 1920 and 1924 for service in the Wehrmacht or the Waffen-SS, amid the acclamation of pro-Nazi supporters and a sizeable rent-a-crowd from across the German border. They had not learnt from their earlier plebiscite, nor indeed from this small country's motto Mir woelle bleiwe waat mir sinn (We want to remain what we are). The call-up for compulsory military service was to turn the stoicism of this largely agricultural country to anger and direct action. Rumours had circulated since 23 August when the decree conferring German nationality on Luxembourgers and those from Alsace-Lorraine had been gazetted in Berlin; publication was prohibited in Luxembourg and German newspapers were impounded at the border. Not surprisingly, however, a copy of the Berlin Official Gazette had been intercepted in Luxembourg and the news and fear spread like wild-fire. The announcing of Simon's big proclamation for 30 August 1942, merely added fuel to the flames. The Resistance announced that they were not going to take this lying down, "we are not Prussians, if they want to call up our young, then we are going to defend ourselves". German assertion of their intent was to lead to a dramatic general strike, the only one in any of the occupied countries. I am indebted to Roger Gaspart's monograph on the strike at the Luxembourg Main Post Office in my reconstruction of this brief explosion of resistance in one location, which lasted all but one hour. From Monday morning, 31 August, tension built, and talk among the staff at the main Post Office was all about the proclamation. Work was virtually at a stand- still and rumours that strikes had broken out in the steel-works in the industrial South of the country and in Wiltz, a little town in the Ardennes, were eagerly picked up and passed on. At the approach of any German employee, the groups dispersed back to their work-places and pretended to work. That afternoon saw confirmation of strike-action in Wiltz, specifically at the primary school. The mood among the sorting-office postmen became steadily more militant, with demands for a resolution to strike: "Let us show these hated Prussians what we think of this whole affair". The youngest members of staff, those most likely to be called up, were understandably the loudest in their demands; the older employees, who had young children at home and who had most to lose materially, showed greater restraint and moderation. But at this stage it was still only 'talk'. The nightshift arrived at the sorting office late in the afternoon and an atmosphere of powerless sullen anger reigned in which work was only sporadic and haphazard. While few mail-bags were being opened, a semblance of work continued and outgoing mail-bags, almost empty, were prepared for despatch. Only letters and parcels manifestly addressed to Luxembourgers who had been deported to Germany for forced labour, were being handled conscientiously. Towards morning the staff in the sorting office agreed to resign en bloc from the VdB (Volksdeutsche Bewegung), an organisation in which the Germans tried to recruit Luxembourgers by threat, cajoling and subterfuge. The night-shift met the incoming day-shift and informed them of their decision. Two of their number agreed to try and talk the older postmen into taking this fateful step. Several showed reluctance, fearing the inevitable consequences ranging from transportation to concentration camps to deportation or imprisonment and the loss of job and thereby means of existence. Some workers arrived well in advance of their shift, eager for gossip and for information on events, sensing the electric atmosphere and yet seemingly unable to take the fatal final step and move to direct action. Confirmation of strikes at the steel-works of Esch and Schifflingen was received. The VdB membership cards and application forms were collected, some tore their's in half, others scrawled "I renounce German nationality". Most gave up their cards voluntarily, several hesitated, fearing the consequences of openly opposing the occupying power. At least the Nazis had left them in their jobs, which meant they could support their families. 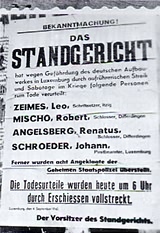 The extent of the withdrawal of labour across the country became clear, including the number of workers and employees who had not turned up for work in Luxembourg City, ironically because of German efficiency. Roger Gaspart, who was scheduled to take over the telegram distribution at 1 p.m. was amazed at the volume of telegrams which were awaiting urgent distribution. They all originated from the DAF - Deutsche Arbeitsfront (the German controlled trade-union) and were addressed to those absent from their places of work. They contained a summons back to work and threatened heavy penalties, including the death penalty. The telegrams were left untouched and undistributed. They lay as a silent accusation at the lack of positive action among the sorting office staff. Around 11 a.m. the postmen drifted back from their curtailed morning delivery rounds either singly or in groups. The offices gradually emptied as the staff left for home and lunch; as yet talk about strike action lacked the spark to ignite it and remained just 'talk'. So far there had only been at best a go-slow delaying deliveries of letters and parcels. While there was a sense of satisfaction that the German war effort was being hindered in this way, there must also have been disappointment that more had not been done. Tuesday 1 September 1.45 p.m.
Gradually the postmen returned from lunch to prepare for their afternoon delivery rounds. The sirens sounded an air-raid and for the first time ever during an air-raid warning, all the staff readily and immediately went to the shelter in the basement, where heated and angry discussions continued. J.P Ensch, a member of the air- raid warning party detailed to check the building was clear of occupants, looked out of the third floor window into the yard and was surprised to see his colleague and friend, Jang Schroeder, 28, enter the sorting office, when he was off-duty. When they emerged from the shelter after the all-clear they found that the sorted letters had been taken out of the pigeon- holes and thrown across the floor - the first open and defiant gesture of sabotage. As they thronged into the sorting-office a voice called out "Stop work". The voice was that of the 18-year old Leon Alff, who was to die in 1944 conscripted into Wehrmacht service on the Russian front. Tuesday, 1 September 2.15 p.m. The authorities, alert to any sign of resistance, moved swiftly. The order declaring a state of emergency and introducing martial law had been signed on the Monday by the Chef der Zivilverwaltung (Chief of Civil Administration) Simon. The Post Office's German director, Likus, made his inspection round and on entering the sorting office quickly noticed the mood of unrest and discontent; he addressed a few words to Jean Majeres, the Luxembourg manager, before returning quickly to his office. On the orders of Likus, Jean Majeres tried to encourage the postmen back to work, but his voice lacked conviction and it was clear that he was merely going through the motions as an alibi. Repeated anonymous calls echoed around the hall, "Everybody Out" and "Let's go home". The atmosphere was electrifying, and all of a sudden, like wild-fire, the summons ran through the building "Everybody to the ground-floor sorting office to protest against the Gauleiter's proclamation". A number of the members of the management team and ftom the post office giro department from the first floor gathered downstairs. It was obvious that a majority of workers had heeded the call. Nicky Konz, a 28 year old junior manager, was looking for Likus, the German director, when he was intercepted by his superior who tried to dissuade him from going downstairs, afraid of the course of action on which he seemed bent. Colleagues, you know what awaits us. The Prussians have decided, against all international law, to enrol our youth into the Wehrmacht, and this despite a solemn promise, made in the name of the Fuehrer and the German Reich, to safeguard our independence made when they invaded our country on 10 May 1940. And Konz proceeded to read the text of the communique of 9 May 1940. A deafening silence followed, soon interrupted by noisy protests. In the turmoil nobody noticed the director, Likus, slip back into the sorting office. Slowly he moved to the centre of the room where a group of young postmen were gathered around a desk. He stopped and urged them to return to work. Nicky Konz saw Likus and marched up to him, ignoring those around him, addressed Likus loudly: "See here, Mr Likus, here is the relevant article. Here is what was published in the Luxemburger Wort of 10 May 1940". And he read the article again. One can only assume that the two had had words upstairs in the management offices before and Konz had sought out Likus to make his point and he did so forcefully and loudly in front of his fellow-employees. Having finished his reading, he asked Likus: "Well, Mr Likus, what do you say to that?" Likus replied evasively: "I won't be drawn into a political statement". Konz then concluded by exclaiming "So this is how the Germans keep their word". Applause all around and finally the cauldron, which had been brewing for days, boiled over. As if freed from invisible shackles, the gathering proclaimed in one voice: "In protest we'll down tools. Everybody out". Likus quickly left the sorting office, no doubt to alert the German authorities. The call to close the counters was swiftly obeyed, the main gate was locked shut and Michel Konz and Metty Schmitz rushed to the public hall, ushered the few customers out and locked the public entrances. All this happened in about 20 minutes and the majority of the staff gathered on the pavement opposite the main entrance to watch developments. A yellow- uniformed Nazi party official arrived at the main gate and was heard to shout: "Martial Law has been declared; whoever leaves his place of work will be shot". The official was unceremoniously elbowed aside and sensibly some of the observers on the pavement withdrew from immediate view to the interior of the adjacent Café Faber. Tuesday, 1 September 3.05 p.m.
Nicky Konz and Marcel di Marco were standing in the corridor on the first floor, looking down into the yard below. They were discussing the events of the last few minutes. The door to the stair-case flew open and two black-uniformed SS officers, obviously in a hurry, entered. One look was enough to persuade Nicky Konz and Marcel di Marco to return to their offices. "It was the last words I was to exchange with Nicky. Barely half an hour later I heard that he had been taken away", said Marcel di Marco after the war. Tuesday, 1 September 3.10 p.m. Following the outbreak of strikes and the withdrawal of labour in Luxembourg City a state of emergency has been declared for the whole area of the Chief of Civil Administration. The application of martial law has been extended. Summary execution of strikers will be carried out by immediate shooting. The Chief of Civil Administration - signed Gustav Simon. He ordered: "Everybody back to work. Nobody leaves the building without my permission". By 3.30 p.m. uniformed SD officers were standing guard at the entrances, while inside everybody was left wondering at the consequences and retributions now the Gestapo was involved. A number of staff called at the sorting office and asked for the post office box of the VdB. They were clearly terrified and wanted to retrieve the membership cards they had surrendered in the morning. At around 4 o'clock Siekmeyer, the Deputy Chief of Civil Administration, arrived and, having looked at the situation, asked sarcastically: "Well, where is this strike then?" Everything seemed back to normal and the delay to the Reich postal service had hardly amounted to a matter of days. Within half an hour a number of offices on the second floor had been cleared of their occupants and taken over by the Gestapo to carry out their preliminary interrogations. With commendable attention to work efficiency, the Gestapo waited until staff had finished their shifts before summoning them for interrogation. Pierre Theissen, a counter clerk, was summoned at 5 p.m. and subjected to an interrogation, which lasted until 10 p.m. Of course he denied any strike action on his part, like all the others. He was lucky that the supervisor of his section, a Nazi party member, no doubt motivated by a well-developed sense of self-preservation, had already testified under oath that all his staff had remained at their duty stations. At the end of his shift at 9.30 p.m., Roger Gaspart was ordered upstairs. An SD officer took down his personal derails, enquired about his normal duties and rota and those of his fellow workers. The focus was on meticulous factual detail and no attempt was made to entrap him into self-incrimination or to betray any of his work-mates. Gradually Gaspart's nerves calmed down as the minutiae of factual questions gave an unreal air of calm and correctness. After about 45 minutes the details had been recorded and Gaspart was instructed to wait in the corridor, and stand facing the wall without talking to the dozen or so work-mates standing either side of him. Finally like so many others, he was sent home. The following day, he was arrested and taken off to Gestapo headquarters for a very physical interrogation. Eventually after a summary trial he was handed back to the Gestapo to be sent for re-education at the Ruwer punishment camp in Germany. Those eligible, among whom was Roger Gaspart, were then forcibly enrolled in the Wehrmacht to be sent to the Russian front. Roger Gaspart deserted and lived to write the story of the Strike of 1942 at the Luxembourg Post Office. Others of course were not so lucky. Nicky Konz was transported to the concentration camp at Hinzert, tried with Likus as the sole prosecution witness, found guilty and shot on 3 September. Jang Schroeder had broken under interrogation by the Gestapo and was shot at Hinzert on the following day. Metty Schmitz died on 23 May 1944 after Gestapo torture and Michel Kons died of his wounds, suffered on the Russian front, in a military hospital on 31 January 1944. Others died in the concentration camps of Moabit, Mauthausen, Neugammen and Eschershausen. Two died fighting in the Resistance. As a result of this general strike, 21 brave men were executed and over 100 were handed over to the Gestapo. Some 13,000 were conscripted into the Wehrmacht, of whom 3,000 lost their lives and some 500 escaped and deserted. A huge resettlement programme saw dangerous intellectuals, like teachers, including members of my family, resettled in Poland and Czechoslovakia, over 5,000 were deported and several thousand transported to concentration camps or imprisoned. In this small country, with its close-knit community, where everybody knew everyone else, resistance to the Nazi invader was always fraught with danger from the quislings in its midst, which it is difficult to imagine in England or indeed anywhere which has not suffered the iniquity of enemy occupation. Resistance meant certain death, if caught. Talk was certainly safer than action. This hour of spontaneous heroic resistance cost too many lives and hardly made the headlines in the Allied press. It pales into insignificance when compared to the sacrifices suffered by Britain, which for so long had stood alone, and which, with Canada, gave sanctuary to the Luxembourg Grand-Ducal family and the Government in exile for the duration of the war. But it was a necessary affirmation of courage and identity from a country under the yoke of its oppressor, which meant it could look its liberators in the eye with pride when the day finally came and deserved Churchill's description of "plucky little Luxembourg". But there is a more personal aspect to this. Listening to my parents, I have often wondered, given the same circumstances, how I would have acted. Would I have salved my conscience by little acts of delay and disobedience, evident only to myself, or would I have bearded the oppressor in the way that Nicky Konz did and suffered the consequences? In truth I do not know the answer and I hope that I will never be called upon to make this choice. This event is usually known as a general strike, the events in the post office were a less important part of it. More important were the walkouts in the steel industry - Luxembourg was one of the top 10 steel producers at the time.